In the movie of my life, juleps might play the role of the piano in Shine, the spinning top in Inception, Pulp Fiction's glowing briefcase or Jerry Maguire's mission statement. They have given me pleasure personally and purpose professionally. During my lowest lows, when bartending was all I had going on and I was beginning to wonder what the hell had happened to me, I could fix a customer a damn good mint julep, watch his or her expression change for the better and know there was at least one thing I still did right enough to merit my getting out of bed. I'd also spent a birthday or two at the bar as a customer, cashing in on the staff's golden rule: You can only order a mint julep for yourself when it is the day of your birth. Any time we were busy, a single julep order could send the bar staff (usually one bartender and one barback, but two bartenders on weekend nights) into the weeds. First ice had to be crushed with our one, hand-cranked crusher, which the back would usually do while a tender began stemming mint leaves and dropping them into a Collins glass. 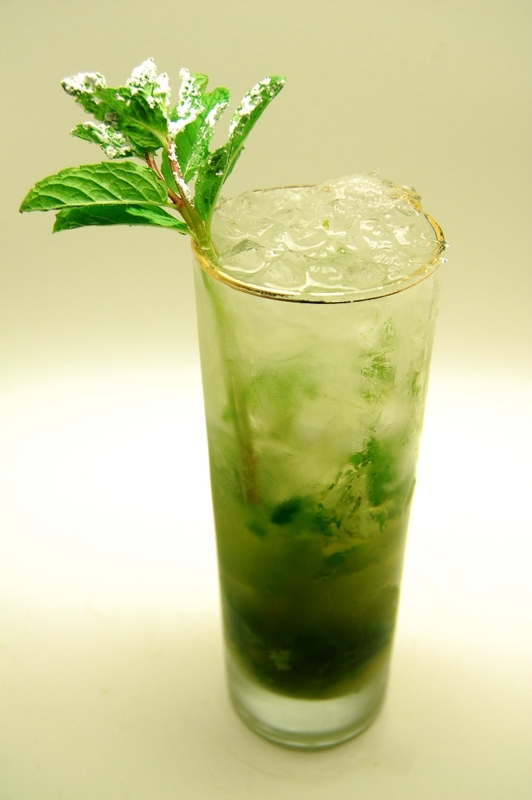 The leaves then needed to be muddled under a coating of mint-steeped simple syrup, after which the crushed ice would be dumped into the glass and a draw of Maker's Mark would be poured. Now, at this point, I suspect some bartenders considered this the end of their julep-making duties -- crushed ice, check; mint, check; bourbon, check -- and would send the drink out, but I was very particular about my juleps. If there wasn't enough crushed ice in the glass to sort of create one, weighty mass, the chips toward the top of the glass would float, which would make it look like half-melted and sloppy. I also insisted upon getting the bourbon and mint flavors in a finely balanced equilibrium (I'm one of those bartenders who taste-test their creations with a quick dip of a straw) and I'd always build the drink in the glass with at least a second round of ice, syrup and bourbon. The whole thing could take three minutes, which, when you consider how long it takes to pop open a can of Old Style, might even be a loss leader. In fact, our juleps were definitely a loss leader, because inevitably while I was making one, someone seated at the bar would become fascinated by my whole, painstaking process and order one more. Truth is, I was always happy to oblige. 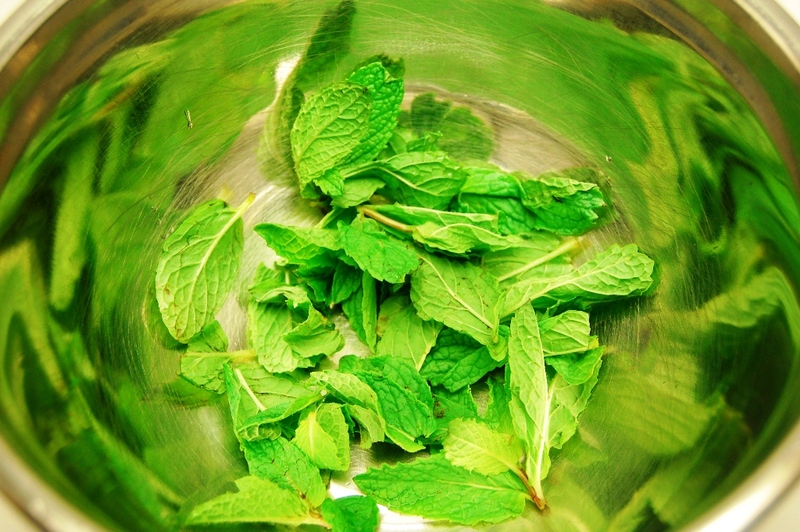 Julep-making was in my bones, if not my muscle memory: Pull mint container out of cooler spin drop leaves into glass spin grab mint syrup from cooler spin pour reach get muddler muddle muddle lunge pull Maker's off shelf pour bubble two three four five six. And so on. For those of you unaware, the Kentucky Derby is on Saturday. It's an all-hands-on-deck day at The Royale. The julep making is insane (we eventually learned our lesson and pre-ordered crushed ice) and the hats are fabulous (did you know that a Derby hat is the same thing as a black lady's churchgoing Sunday-best hat?). I miss it. I am especially missing it today, not only because today begins the blog's Three Days of Juleps, but also because today I made myself a Gin Julep. I found the recipe in the Old Mr. Boston Official Bartender's Guide that our friend Alex recently bestowed upon us, and it sounded good. Actually what it sounded like was, why don't people mix mint and gin more often? Doesn't that seem like obvious deliciousness? And it is. What's also obvious: This is your new gin and tonic. Gin and tonics, we've no need for you any further. Summertime, in fact, will be just the same -- if not way better -- without you. (I've lifted these directions directly from the book.) Put 12 mint sprigs of fresh mint into a bowl and cover with powdered sugar. Add just enough water to dissolve the sugar and then muddle well. Place half the crushed mint and liquid into a Tom Collins glass. Fill glass half full of shaved ice and then add rest of crushed mint and fill the glass with shaved ice. Add Old Mr. Boston Dry Gin [Ed. note: which I did not use; does it still exist?] and place in a refrigerator for about 30 minutes. Before serving, decorate with sprigs covered with powdered sugar. Serve with a straw. 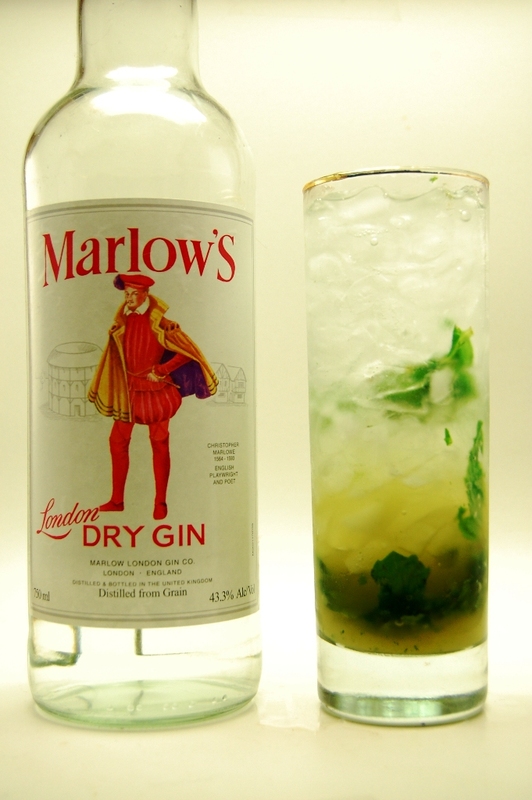 I was originally considering using my Bulldog London Dry Gin in this recipe, but the truth is, when you're bludgeoning (albeit beautifully, traditionally and happily) a liquor with mint and sugar, you can go cheap. So Marlow's it was. Use a little less sugar than you might think necessary to cover the mint leaves (the point is not to just snow-plow over them; you should still be able to see them a bit) and way less water than you think you'll need. A paste is better than a soup here. I don't know why you're supposed to give it a half-hour in the fridge, but I think it's so neat to say (if only to yourself), "Oh, I'm just letting my cocktail rest a bit" that I don't care. To do a sugar-covered mint sprig, don't try to actually cover a sprig with sugar. Instead, dip the sprig into the sugar.